New organizations have been created to coordinate international mitigation efforts in the event of an impending NEO threat. A special United Nations team on hazardous asteroids has been dissolved after completing its task of setting up organizations to deal with planet-threatening space rocks. The UN's Scientific and Technical Subcommittee of the Committee on the Peaceful Uses of Outer Space formally dissolved its Action Team 14, in recognition of the group's successful completion of its mandate to coordinate international mitigation efforts for near-Earth object (NEO) threats, officials announced last month. "Everyone's contributions made possible that IAWN and SMPAG now exist and have work plans for the next several years. Their existence is truly a tangible and very important step in protecting Earth from an impact by an asteroid or in mitigating the consequences if the Earth should receive an impact," said Sergio Camacho, who served as chair of Action Team 14 (AT-14). Artist's view of the detonation on Feb. 15, 2013, of a space rock over the Chelyabinsk region in Russia, considered a 21st-century warning shot. It has been more than two years since a sky blast rocked the Chelyabinsk region in Russia, caused by a previously undetected space rock that fragmented high in the atmosphere. Many experts regard the Russian meteor explosion as a global wake-up call about the very real dangers that asteroids present. IAWN and SMPAG are designed to help the world deal with that threat. IAWN's purpose is to establish a worldwide effort to detect, track and physically characterize NEOs, to determine those that are potential impact threats to Earth. This network consists of a partnership of scientific institutions, observatories and other interested parties performing observations, orbit computation, modeling, and additional scientific research related to the impact potential and effects of asteroids. The primary purpose of the SMPAG is to prepare for an international response to an NEO threat through the exchange of information, development of options for collaborative research and mission opportunities, and conducting NEO threat mitigation planning activities. SMPAG is currently chaired by the European Space Agency (ESA). Both groups have had their first meetings. For some, the closing down of AT-14 is bittersweet. "I have been working in the Action Team 14 since 2008. 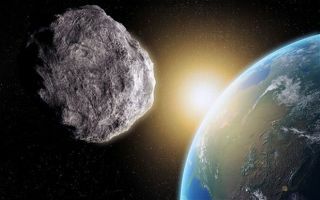 That's just when it started with the task to develop a recommendation on how to react to an imminent impact threat on an international level," said Detlef Koschny, head of near-Earth-object activities at ESA's Space Situational Awareness office in The Netherlands. "Now the work of the action team is done … and I think we can all be proud," Koschny added. "We have indeed accomplished our task. A way forward is in place and being implemented by the formation of the IAWN and SMPAG. It was great to be part of this team." The success of AT-14 underscores the fact that, despite potential political differences, "countries can work together productively to deal with global threats," said Ray Williamson, retired director of the nonprofit Secure World Foundation and a member of AT-14 for some six years. Williamson said that AT-14 provided the expertise and the necessary pursuit of organizational detail to make the process of the UN's Committee on the Peaceful Uses of Outer Space go successfully. That success, Williamson said, led to producing the organizations capable of meeting the asteroid threat now and in the distant future. "Well, it took longer than I would have thought — seven years — but I think it produced a worthy result with international support for establishment of the IAWN and SMPAG," said Lindley Johnson, NASA NEO programs executive within the Science Mission Directorate in Washington, D.C.
"Although still in large part led by U.S. efforts, it has shown the space agencies and offices in countries around the world they can make a worthwhile and important contribution to efforts to find and track the impact hazards, and in determining what we do when we find a credible impact threat," Johnson said. Work is continuing on how to best deal with thwarting a threatening near-Earth object. Former NASA astronaut Tom Jones is chairman of the Association of Space Explorers (ASE) committee on near-Earth objects. ASE is an international nonprofit professional and educational organization of about 400 astronauts and cosmonauts from 36 nations. It has played a leadership role in calling global attention to asteroid threats for decades. "As the Action Team 14 closes out its activities at the United Nations, with well-deserved recognition, what the UN must now sponsor are discussions on how to authorize and execute an international deflection effort, so that those vital details are in place when we are confronted by an impact threat," Jones said. ASE, he added, will continue to urge progress in this area. One result from the work of AT-14 is a call to bring together international disaster response agencies in an impact disaster planning advisory group, said William Ailor, distinguished engineer at the Center for Orbital and Re-Entry Debris Studies at the Aerospace Corporation in El Segundo, California. Ailor, also a participant in AT-14 deliberations, said such an advisory group could become aware of the nature of an asteroid impact threat and look at responses to an asteroid impact that might involve agencies from multiple nations. "This recommendation has not been approved," Ailor said, "but disaster response agencies in several nations have had tabletop exercises to acquaint themselves with how such a threat might evolve and how response to an impact disaster might compare to disasters caused by earthquakes, tsunamis, tornados and hurricanes."